On Sunday, Bishop Brian Tamaki defended his convenant and the practises of his Destiny Church in a Sunday Star Times article. I felt that his general response of 'I didn't ask for this treatment' to be worthy of a Tui billboard - yeah, right! 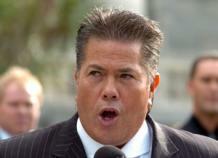 Brian Tamaki stated that there was an "unauthentic protocols" document in circulation. This was the one where instruction is made that Destiny Church members should lay gifts down at his feet and bow down to him and his pastor wife, Hannah. To this, Tamaki answered that the moves "...did not originate with me and there is no inclination on my part to be approached in this way." But in the sentence just before those statements he appears to contradict himself by saying that "Destiny has protocols which compare to that of any other organisation that values order, respect and unity in their environment." But he still defends his church's actions in having '700 sons' convenanted to him as "...the founder and spiritual father of this movement." Tamaki states that he considers this to be "...pure bible and revolutionary." He then goes onto cite the Old Testament and the lives of Elisha and his spiritual father the prophet Elijah, and then the New Testament work of the Apostle Paul and his spiritual sons, Timothy and Titus as providing biblical precedents. What disturbs me, though, is that the Bible is being wrongly utilised to further enhance Tamaki's status. In fact, many academic scholars have commented that Destiny now has all the hallmarks of a Christian-based cult. Tamaki's article in the SST has not allayed any fears about this. In my view, the bishop did not defend his actions in a very plausible way either. I would sooner believe that Elvis was still alive than accept that Tamaki had not initiated any of the protocol suggestions. After all, a good cult leader must seek to exert authoritarian control over his flock. Again, Bishop Brian's own words provide ample evidence of this: "The difficulty today's liberal society/church has with this model (the Destiny Church model) is that it's not democratically driven." Hence, no one within Destiny can question the word of Tamaki or his wife Hannah. Yet, despite all the criticisms thrown at Bishop Brian, some central and local government politicians are ready to defend him. Waitakere Mayor Bob Harvey (whom I've always thought of as somewhat stupid) said that as none of his members weren't doing drugs or bashing people up, then that was a good thing. Ditto talkback host and Whanganui Mayor Michael Laws who made similar statements in his Sunday newspaper column. Destiny recently also announced that their conference had been attended by Pacific Island MPs Sua William Sio (Labour) and Peseta Sam Lotu-Iiga (National). These MPs then praised the work of Destiny within their communities. While it is true that some church members have come from dysfunctional backgrounds, it is the lure of authority that attracts these kinds of lost souls in the first place. While Destiny represents a different type of authority than that of, for example, the gang world, what is really happening is that their mainly Maori and Pasifika congregations are merely swapping giving money for drugs and booze to giving money for Brian's lifestyle. Their new drug of choice is to listen to Brian for a couple of hours on Sunday morning and that gives them their high for the week. All the while, Brian and his whanau are 'blessed' with the proceeds of their parishioners which he then spends to maintain his lavish lifestyle. Therefore, what's the difference between him and a wealthy gang boss? The only difference is that Brian is able to make a living via his church being legally recognised as a charity while the proceeds of crime of the gang boss are deemed illegal. As I said in a previous blog, authoritarian based cults like Destiny tend to flourish in democracies like ours. My only hope remains that some of his church members will see through the rhetoric and leave. In the meantime, Brian will still continue to proselytise in order to attract new customers, I mean, converts. And Tamaki will establish his hold over them through Destiny's covenants and protocols.